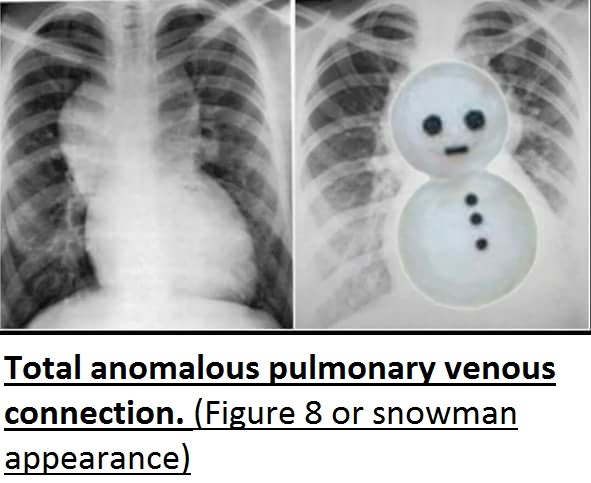 Study Medical Photos: Total Anomalous Pulmonary Venous Connection- A Congenital Heart Defect. Total Anomalous Pulmonary Venous Connection- A Congenital Heart Defect. Total anomalous pulmonary venous connection, also known as total anomalous pulmonary venous drainage and total anomalous pulmonary venous return (TAPVR), is a rare cyanotic congenital heart defect of the pulmonary veins where all four pulmonary veins are malpositioned and make anomalous connections to the systemic venous circulation. Pathophysiology: In normal circulation, blood is sent from the right ventricle to pick up oxygen in the lungs. It then returns through the pulmonary (lung) veins to the left side of the heart, which sends blood out through the aorta and around the body. Treatment: Surgery to repair the problem is needed as soon as possible. In surgery, the pulmonary veins are connected to the left atrium and the defect between the right and left atrium is closed. Prognosis: If this condition is not treated with surgery to repair the problem, the heart will get larger, leading to heart failure. Repairing the defect early provides excellent results if there is no blockage of the pulmonary veins at the new connection into the heart. Infants who have obstructed veins have worsened survival.